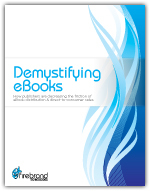 How publishers are decreasing the friction of eBook distribution & direct-to-consumer sales. 'Demystifying eBooks' offers an industry census of the challenges publishers face in navigating eBook distribution and sales. Read through a survey and various case studies and explore more about this topic, along with comments from publishers, industry experts, and the Firebrand Technologies team. This study will provide a revealing and informational take on the eBook business, with real life examples on how to approach industry pain points.